Flogging (aka Food Blogging): White Chocolate Mousse with Pumpkin Gelato, Chocolate Triangles. White Chocolate Mousse with Pumpkin Gelato, Chocolate Triangles. The pumpkin gelato was heavenly! Unfortunately, the picture came out a little bit darker than I would've liked. Authentic gelato only uses whole milk (so says Wiki), so maybe this isn't a real gelato so much as it is a really creamy ice cream. Also, for a better mousse, use whipped egg whites instead of whipped cream. 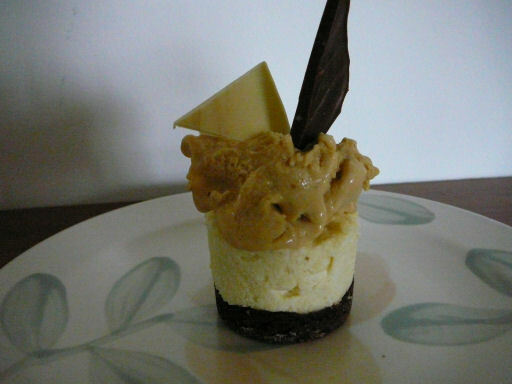 The cream is heavier, and results in a product that resembles a smooth cheesecake rather than a mousse. Combine the heavy cream, milk, and 1/4 cup of sugar. In a separate bowl, whisk the egg yolks and sugar together, until it achieves a mayonnaise-like texture. Heat the heavy cream mixture, until it simmers and forms bubbles on the edges. DO NOT BOIL! Add the heated heavy cream mixture into the egg yolk/sugar paste, in increments, whisking continuously. You must whisk continuously, and add in gradations, or else the eggs will curdle. Return the heavy cream/egg mixture back to the pot, and continue to simmer. Add in the remaining ingredients; pumpkin, all spice, rest of the sugar. Continue to whisk until the eggs start to thicken. DO NOT overcook the eggs, or else they will curdle. Whisking is very important. Remove from heat immediately, and cool off in an ice water bath. Refrigerate for ~ 1 hour. Churn for ~ 20 minutes, then freeze overnight. Thaw in refrigerator before use. - Dark or white chocolate, preferably 50% caocao content or higher. Heat chocolate in a bowl placed in a water bath, or in a double boiler. Never heat directly in a pot, as the chocolate will burn. Heat until melted, then smoothe out onto wax paper. Cut into shapes, or use a knife to make curls. Refrigerate to harden, keep for future use. Makes about 6 x 6 oz. ramekins, or 12 mini-cheesecake sizes. Real mousse recipes use uncooked beaten egg whites instead of heavy/whipping cream, but to avoid salmonella, I will just use this slightly less tasty method. Whisk together egg yolks, milk, sugar, and salt until blended. Sprinkle gelatin over mixture, and let stand ~ 2 minutes. Add in chopped chocolate. Cook over low heat ~ 15 minutes until mixture thickens (like the gelato recipe). Add in vanilla; chocolate should be completely melted. Remove from heat, let cool, and refrigerate ~ 2 hours. Whip the heavy cream with a mixer until stiff peaks form. Fold into the cooled mousse mixture. Pour into containers, and let sit overnight to harden.